Today is picture day at daycare. The staff requested that all the children wear denim and white---jeans, skirts, overalls, whatever. I guess they are going with a Western theme. They told the parents this approximately 16 hours prior to photos, which I'm a little put out by, but that's for another story. Today, this is about our children. Our stubborn, hard-headed, independent, do-it-myself kids. I've waited years for these kids to be able to dress themselves and lighten my load a little, so you'd think there's really nothing to complain about here. But the thing is, we are in that stage where they want to choose what to wear (no matter the practicality or comfort level) and they want to dress themselves (and put shoes on the wrong foot). So, I put together some clothes this morning and they weren't having it. So for western day, my kids wore rain boots and nothing denim. Yee haw! And you know what? I don't really care. It's exhausting to fight about it when it doesn't really even matter. The photographer will slap a toy cowboy hat and bandanna on them, and they will look ridiculous, and it still won't matter. I'm not going to buy the damn pictures anyway because the school insists on taking photos every 3 months and it totally irritates me. Why is this necessary? So, why am I sharing this? Because it makes me feel better. Because I know that other moms are having the same issues with their stubborn, independent children, too. It's OK to laugh, because this was funny. But it's also OK to shake your head and say "yep," because you've been there. And you get it. No matter how much we think we are teaching our kids, or helping our kids or whatever. 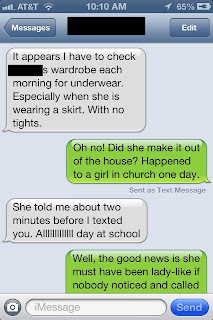 The bottom line is they will still occasionally leave the house without underwear on. Or, in our case, Spiderman rain boots on western day. And really, it doesn't matter. You are SO right! Will it make a difference a year from now, a month, week or even a day?! NO! Let them be independent as long as it is safe. They will have many years that they will be forced to conform to what someone else dictates is required dress code, or behavior, or whatever. Ting wears uniforms to school, so this summer I've been letting her pick out her clothes each day. Today she left the house is the fanciest dress she owns!